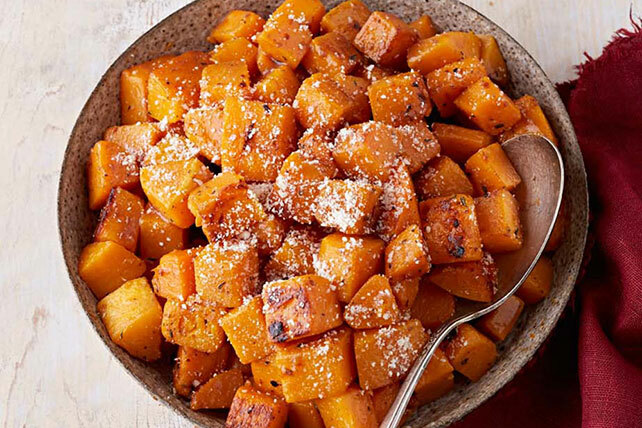 Smell the tastiness of roasted butternut squash before it gets to your plate! Vinaigrette and Parmesan give Pan-Roasted Butternut Squash its unique flavor. Bring squash, water, butter, thyme and pepper just to boil in large skillet on medium-high heat; cover. Simmer on medium heat 5 to 6 min. or until squash is crisp-tender. Uncover skillet; cook squash on high heat 4 to 6 min. or until squash is lightly browned and liquid is cooked off. Remove from heat. Add dressing; stir to evenly coat squash. Sprinkle with cheese. Butternut squash has a smooth beige skin and a slightly bulbous base. Typically weighing between 2 and 3 lb., this winter squash has an orange-yellow flesh with a sweet, slightly nutty flavor. To prepare, simply cut off both ends of the squash and peel before cutting squash lengthwise in half. Scoop out and discard the seeds and stringy fibers, then cut squash into cubes. Squash can be cut up in advance and stored in a tightly covered container in the refrigerator for up to 24 hours before being used as desired.